The birth of Oswald's blog preceded mine by a few months in 2005. And my acquaintance with 'Oswald' preceded that. Today he has announced he is stopping. Lost the energy for it he says. Far be it from me to speculate, put two and two together and make five, but I will. Are libertarians losing heart? Or do we just reach a point where everything we think has been said, and then some. Back in the early 2000s we were more energised, had two political hinge-points (ACT and Libz) the tension between which, of itself, kept the passions stirred. What do we have now? I am mildly mollified by a National government making some welfare reforms but in general we have the Greens in ascendency, National and Labour big-government protagonists both, ACT down the toilet and Libertarianz, for all their efforts and genuine people, gaining no traction. And age comes into it. Our mortality looms larger daily but the desire to make our lives matter does not diminish. Making something may be giving our growing children the time and environment that launches their own adventure. It may be no more than leaving behind children and grandchildren who remember us fondly. But I speak for myself. I am not trying to second guess Oswald in this respect. Oswald won't have made his decision lightly. Blogs become an integral part of your existence. Sometimes a welcome outlet, sometimes a tedious obligation. Certainly a habit, even an addicton, though I am sure real addictions provide more excites than blogs. Perhaps when the obligation aspect starts to overwhelm the creative vent, it is time to pack up. Even then you think, will the cessation be followed by regret or relief? Anyway dear Ossie Bastable I will miss you. Reading a story about 11 Somalian refugees living in a 4 bedroom home in Christchurch one can have sympathy for their situation, past and present. And the racism displayed by potential private landlords is unfortunate but no laws can change it. So they continue to live 11 in a 4 bedroom house by choice. I can understand the reasons why people would turn down certain houses or neighbourhoods. I can understand why people might choose to pool extra income by sharing one home. But what I don't get is why they then feel entitled to go the media (assuming that is how the story got out) about their 'plight'. Housing New Zealand has an obligation to find them accommodation and it would appear are doing their best. If anything the story is an indictment on the state of Housing New Zealand stock and not uncommon deterioration of neighbourhoods they proliferate. And racists. Rodney Hide will be taking the affirmative for Sir Doug Graham losing his knighthood and Stephen Franks the negative. "Last year 80,000 people went off benefits and into work. That is actually one person for every minute of every working day." The number of working age people on benefits rose from 351,000 to 353,000 last year. Which means 82,000 must have gone onto benefits. That is actually one person for every minute of every working day. "National's war on the poor"
Sue Bradford seems to pop up all over the show wearing different hats. The last one I saw her in was BAIS (Beneficiaries Advocacy and Information Service). Yesterday it was Auckland Action Against Poverty. Never short on hyperbole she describes the reforms that went to select committee yesterday as "shameful", "punitive", "paternalistic", "harassment" and "an important strand in National's war on the poor." - The expectation that beneficiary parents to be available for part-time work when their youngest turns five. Most mothers return to work before then. - Paying young beneficiaries power and rent directly and limiting their benefit cash to an allowance. - Providing enough childcare to allow young mothers to stay in education. - Warning beneficiaries if they have another child while on welfare, and their existing child is at school, they will only get one year free from work expectations - the same as for non-beneficiary parents under parental leave. Bringing beneficiaries into the real world, having the same expectations of them as everybody else, is a great thing. Sue Bradford could be reminded about the 'soft bigotry of low expectations'. That's where she seems to be at. For a change, some welcome news from the world of politics. Credit where it's due. Well done Labour MP Maryan Street. This is a bill one I will be following and supporting, if it is drawn. A lot of what pass for comments on The Standard are ignorant insults. Psycho Milt has also blogged about this. Mothers who have a second child  whose older child is fourteen will be forced to be available for FULL TIME  WORK when their baby is ONE YEAR OLD. No we should not be discouraging mothers to have more than one child by punishing the child and treating the child as a second class citizen. In fact we need more children in our society as we do not have enough workers to support the increasingly elderly population. Mothers are bringing up the future workers who create the value from which profits and taxes are taken. If these children would  not find work  when they grew up; that  would be  the fault of the failing capitalist economy,  the rip offs of the bankers and corpoations; not the fault of the  mothers or their children . It would also be  the fault of decades of financial and social deprivation- ie poverty and ill health caused by inadequate incomes, poor housing and health care; and the kind of prejudice and discrimination favoured by people like  Lindsay. I had commented in support of National's policy to discourage beneficiaries adding children to their benefit by exempting the caregiver from part-time work-testing for only one additional year. That part-time work, if she can find a job, could constitute as little as 12 hours. Alexandra is correct to point out that if her next youngest child is already 14 she would be full-time work-tested (30 hours). But only 1 percent of MSD clients who added a subsequent child had a youngest child aged 14+. And the argument she uses for encouraging women to have more children - whether on a benefit or not - "we do not have enough workers to support the increasingly elderly population" - can be used for increasing the workforce participation of working-age females. Often mothers. Probably the sort of thing Roger Douglas promoted for so long. 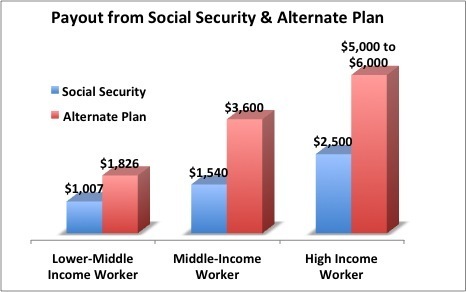 Research described in the Spectator (hat-tip NCPA) finds that US citizens who opted out of social security for an 'alternate' plan are much better off when it comes to retirement. There is also a disability benefit that pays immediately upon injury. Social Security's comparable benefit comes with a six-month wait, and includes other restrictions. The plan avoids the pitfalls of pay-as-you-go systems by giving workers only what they pay in....The experience of the three counties' employees over the past 30 years speaks to the effectiveness and efficiency of the plans. While paying out substantially higher payments to retired workers, the plans do not face burdensome unfunded liabilities that haunt many states' legislatures. Perhaps the left would prefer the lower pay-outs because they are more even under state social security (the lower income contributors are topped up from higher). Individuals at all levels however are better off under the alternate plan.